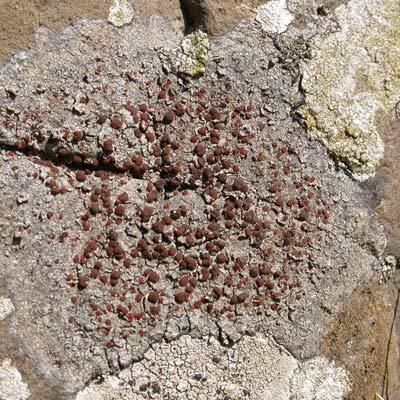 Caloplaca crenularia is a frequently occurring crustose species with distinctive, rust-coloured discs (to 1mm diam.) on a mostly cracked, grey-coloured thallus. Poorly developed forms are often pimpled with small, red swellings. The discs when wetted remain unchanged, but should they turn greenish, then this is likely to be the related species C. ceracea. 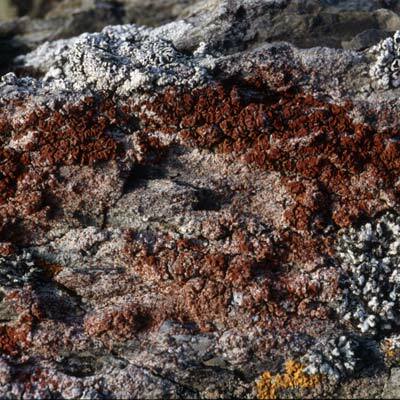 It occurs on siliceous rocks, inland as well as by the sea. It can be frequent in churchyards and is relatively common throughout Ireland. Discs remain unchanged on wetting. Simms, M. J., (2016). 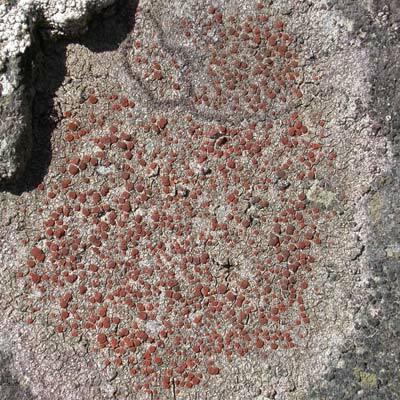 Caloplaca crenularia (With.) J.R.Laundon. [In] LichenIreland.